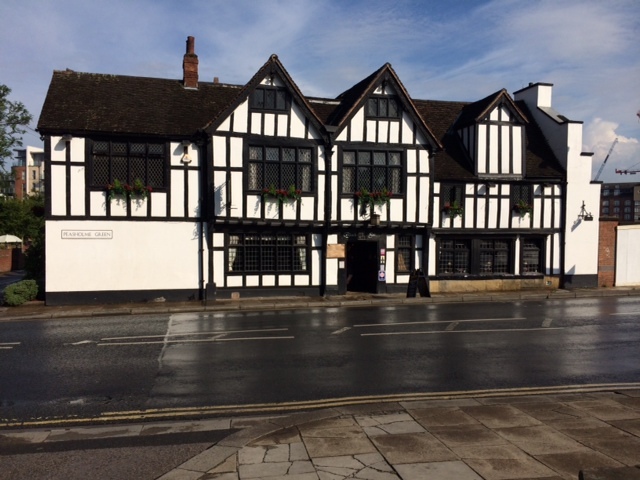 The first real meeting for York Hackspace was in The Black Swan on Peasholme Green. There were few meetings at The Black Swan before the hackspace moved to version 1.0. York Hackspace version 1.0 was a small room in Guppy’s Enterprise club, a meeting venue for all kinds of clubs. Having this space allowed us to slowly grow our membership while keeping costs to a minimum. With very little project storage space and no space to keep larger equipment, we knew that we eventually wanted a different space. Almost completely out of the blue came an opportunity for a low-rent space of our own, in the corner of a floor of Stonebow House. 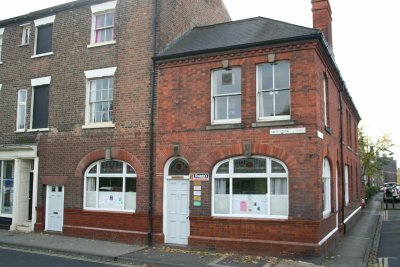 York’s “Arts Barge project” had an entire floor to sub-let to artists and creative groups. Finally we had a space to keep equipment and tools. 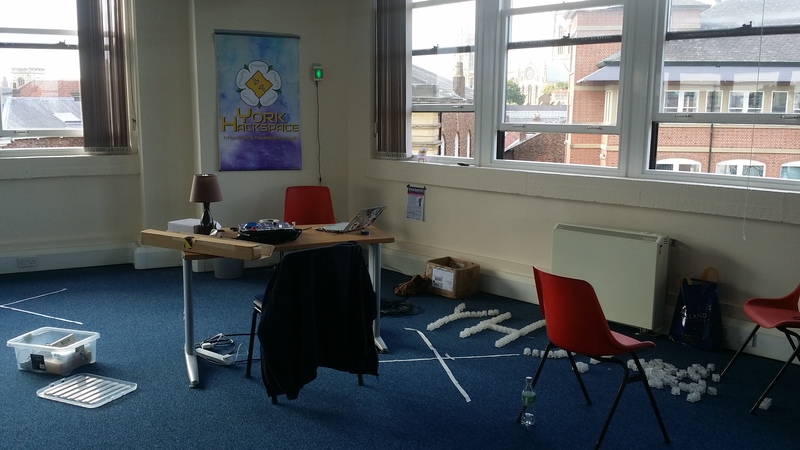 We knew it was only temporary, but we had a real hackspace. It even had a 3D printer. This picture was taken just after we started to move in. See this as a bug-fix release. Complications on floor two forced us to move. Fortunately we and the other Arts Barge tenants, were able to move to floor four. 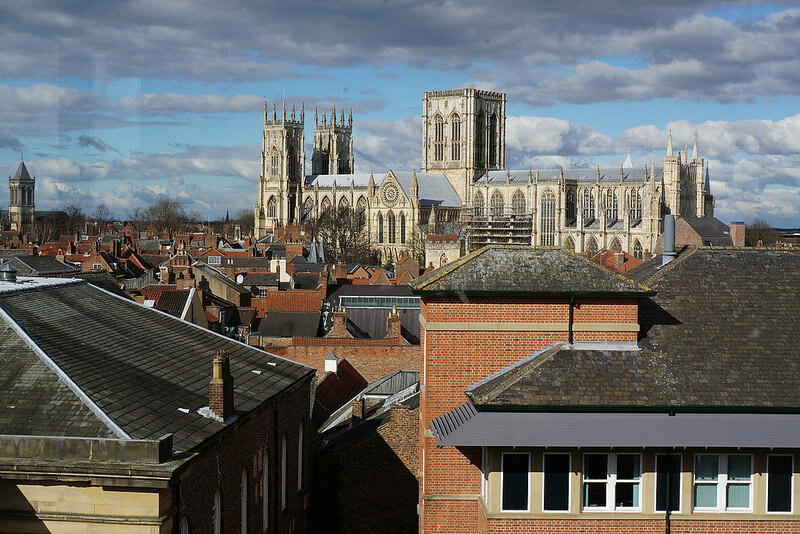 Stonebow house is a fairly tall building and floor four gave us one of the best views in York. The whole floor essentially had a panoramic window with the York Minster in full view. We knew we didn’t have long in Stonebow House, but the notice still arrived unexpectedly. After moving out, we decided to go back to The Black Swan for our regular meetups. With a taste of real space, we were immediately looking for a new space we could move into. Huzzah! A proper non-temporary space that we can truly call ours. Just a short walk from the city centre. 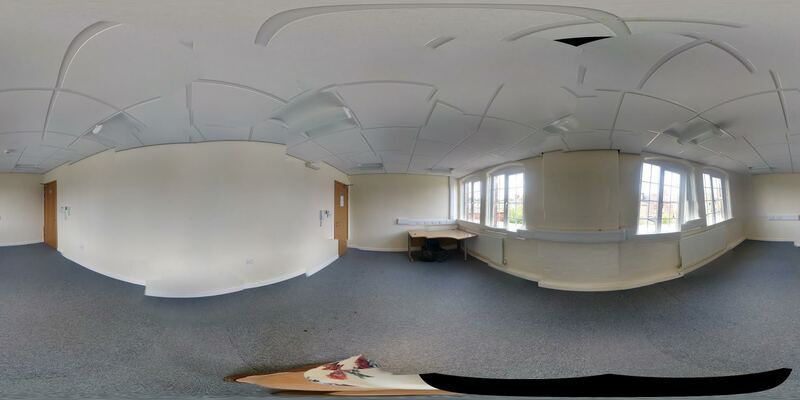 As of the 15th of August 2016, we now have some office space in Fulford business centre.